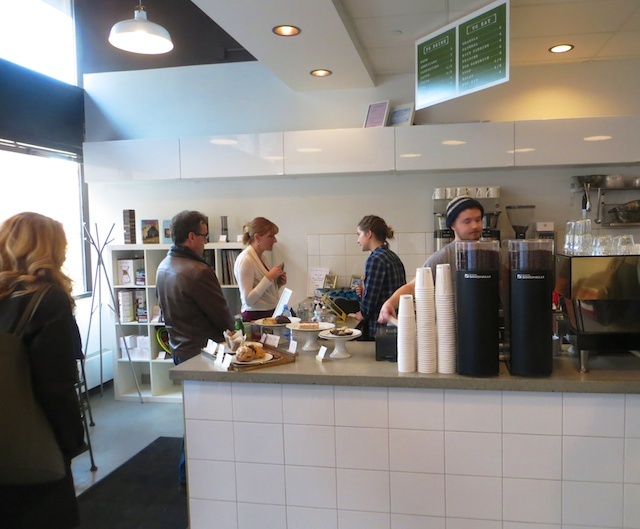 Until recently, Edmonton’s coffee scene was best described as slumbering. But suddenly, it’s jolted to double-shot life, to the point where it’s surprisingly surpassed Calgary. Consider that four (that’s right, four) new, independent coffee shops have opened in the first half of this year. Indeed, two— Coffee Bureau and the basement Lock Stock Coffee, attached to Red Star Pub—are across the street from each other on formerly moribund Jasper Avenue. A third, Barking Buffalo Cafe, has joined the action on fashionable 124 Street, where Credo added a second outlet a year earlier. 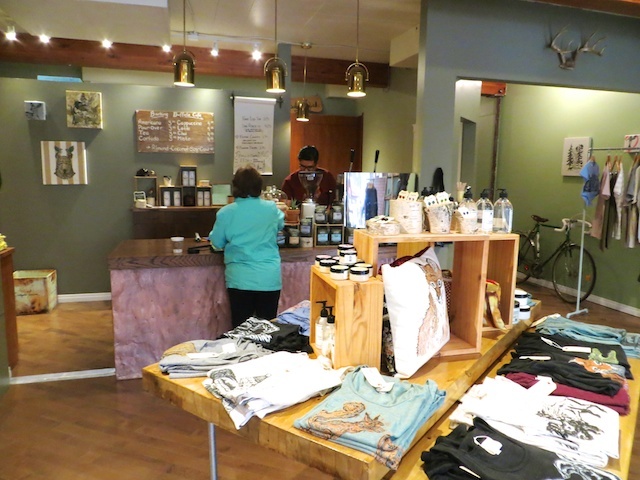 The last of the new arrivals, Little Brick Cafe and General Store, is part of Nate Box’s growing empire, which includes two newish downtown locations, Burrow (in an underground light-rail transit station) and District Coffee. If there’s a theme to this caffeinated surge, it’s this: Hole-in-the-wall spaces with limited seating and a firm focus on crafting fine espresso-based drinks and offering just a few baked treats. It’s also interesting that the roasts in these places lean to the dark side, a pushback, perhaps, against the lighter beans long fashionable in aficionado coffee circles. 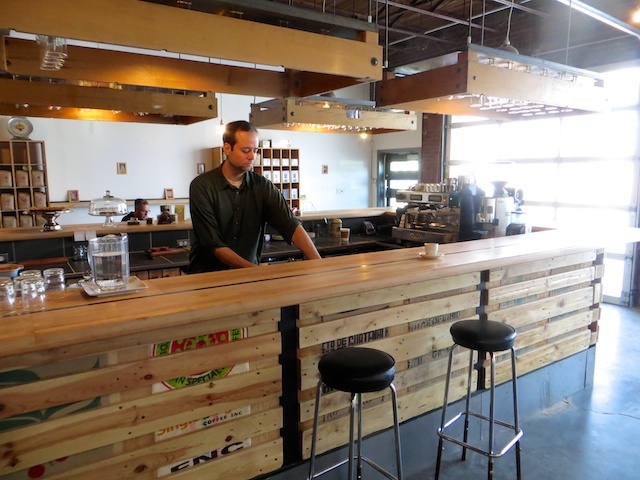 Coffee Bureau is symbolic of the new-look Edmonton cafe. 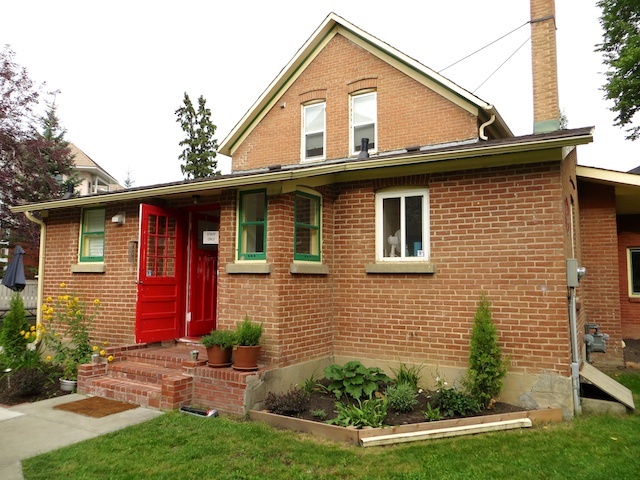 It’s elegantly spare, containing maybe a dozen seats at pine tables and benches along the front window and a side wall decorated with good, local art. Yet it doesn’t feel cramped. The nice, darker espresso beans are from Edmonton’s new Ace Coffee Roasters and the muffins and croissants from Garneau’s Leva Cafe. Featuring beans from Toronto micro roaster Pilot, Barking Buffalo Cafe is a unique combination of coffee shop and clothing designer/retailer Salgado Fenwick. It’s another caffeinated 124 Street option to those who don’t want to line up for the uber popular, excellent bakery Duchess. Not to be left out, Edmonton’s south side will soon be joining the fun. The Woodrack Cafe is set to open on 109 Street later this year, and long-time local roaster Transcend Coffee will move into the new Ritchie market in 2016. Will all these new coffee shops survive? Who knows. This much choice doesn’t seem to have hurt Seattle or Portland. One thing’s for sure. 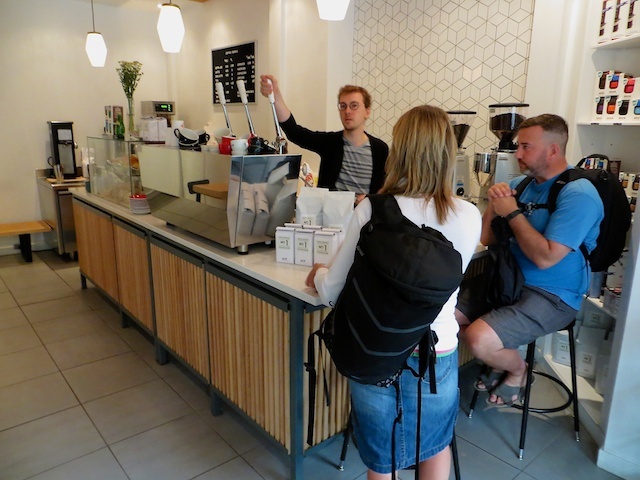 Edmonton is embracing micro coffee shops with a religious fervour. Perhaps that explains why, of the new entries, only Little Brick is open on Sunday. This entry was posted in Alberta, coffee, Edmonton and tagged Edmonton coffee on August 20, 2015 by bcorbett907. I almost wish *Iconoclast Koffie Huis doesn’t get a lot more walk-up business. It’s selfish, I know. 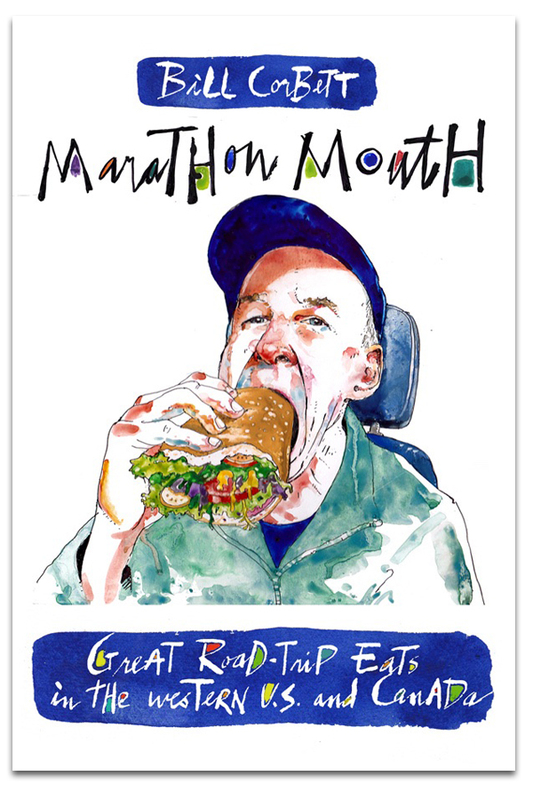 But in the four times I wander in over a week, co-owner Ryan Arcand shakes my hand, asks if I want my usual Americano or pour-over coffee (accompanied perhaps with an excellent muffin) and embarks on a long, relaxed chat. He greets occasional other customers by name, introducing them to anyone else who’s pulled up to the counter of this ultra-cool coffee bar. Conversations between strangers (new friends?) ensue, in stark contrast to the eyes glued to screens in most contemporary coffeehouses. I’m sure things won’t always be this leisurely. But for now at least, Ryan seems perfectly happy with his low-key approach to marketing this new, central Edmonton coffeehouse. For one thing, it’s a bit hard to find, on a little side street across from a cemetery, with only a sandwich board advertising its presence. Indeed, Iconoclast’s website doesn’t currently mention the coffee bar, let alone its hours of operation. That’s because most of its business is roasting wholesale beans for a growing list of discerning local restaurants and cafes. The small-batch roaster is at the back of an old, long warehouse that’s been lovingly refurbished with lots of repurposed wood, especially at the front coffee bar. On nice days, the bay doors might be rolled up, a table or two pulled out and a chessboard set up for an extended game between Ryan and local sculptor/part-time barista Rob Willms, who helped refurbish the place. Like I said, it’s laid back. While all things coffee course through Ryan’s veins, he’s perhaps most excited about the prospect of roasting cocoa, of all things, for use primarily in his partner’s (Sjoukje Bouma) line of Pinto chocolates. 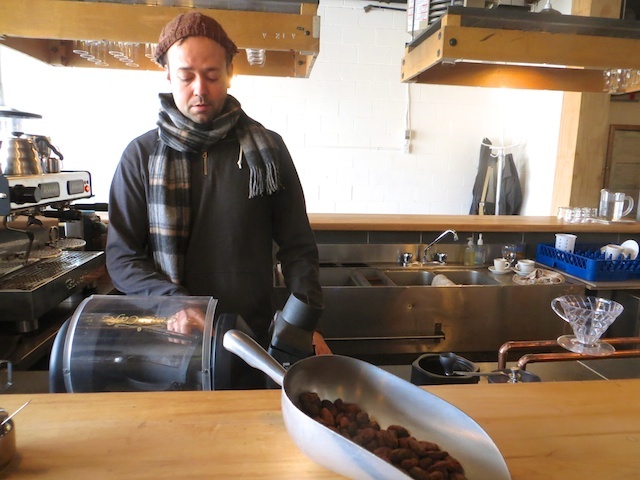 During one visit, he roasts a small batch of cocoa beans and scatters them on the counter for customers to sample. They’re nutty, delicious and addictive, the smoky flavour lingering long after I’ve resumed my more frantic day. Folks, this is what a great coffeehouse is all about. The latest entry in Edmonton’s downtown-area cafe scene is District Coffee Co., an offshoot of Nate Box’s popular Elm Cafe, though slightly larger (two tables!, along with some window seating). It’s already attracting a loyal clientele lining up for espresso-based drinks and a short, ever-changing menu of creative soups and salads, scones and other in-house baked treats. 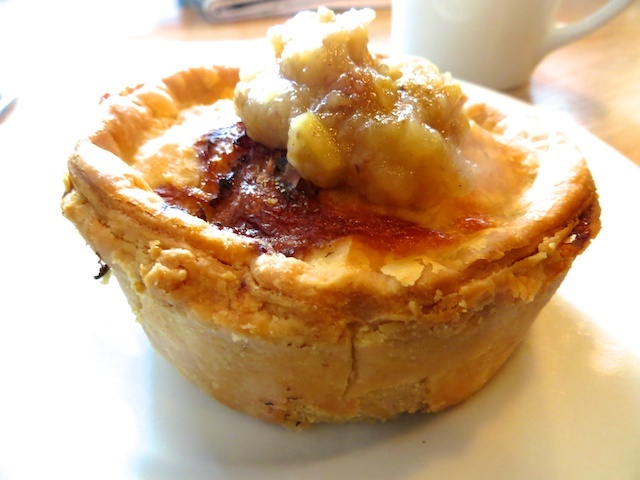 The day’s pot pie ($8) is a steaming mix of pulled pork and Granny Smith apple wrapped in a flaky pastry—a nice, light lunch accompanied by a strong Americano (using Calgary’s Phil and Sebastian beans). 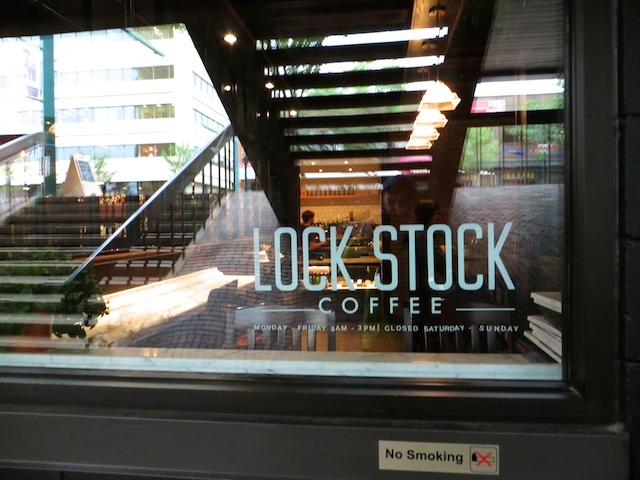 A couple of downtown Edmonton coffee shops have come and gone. But Credo remains a stalwart. The reasons? It’s a smartly-run place, with two espresso machines and a little line of pour-overs pumping out good Intelligentsia coffee to a steady stream of caffeine seekers. What really makes it stand out is the seven (seven!) 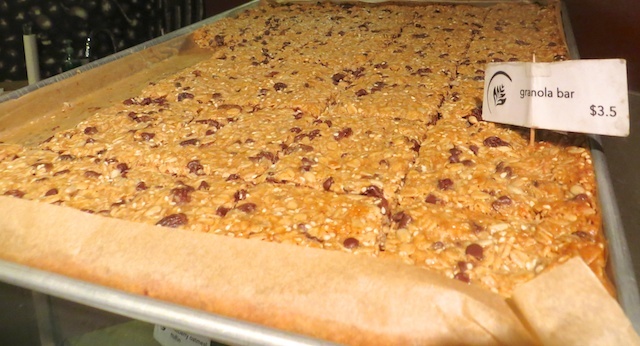 types of fresh muffins pulled regularly from its oven, along with house-made granola bars. It’s the details that matter, and Credo checks every box. This entry was posted in Alberta, coffee, Edmonton and tagged Edmonton coffee on April 11, 2014 by bcorbett907.